Here is the most powerful explosive existing in Minecraft Bedrock and it is not comparable to ordinary dynamite. This addon increases the power of the TNT explosion tenfold, which opens up new boundaries for the explosion. In fact, this is only a small upgrade, but it really is relevant for large cities or crowds of enemies. 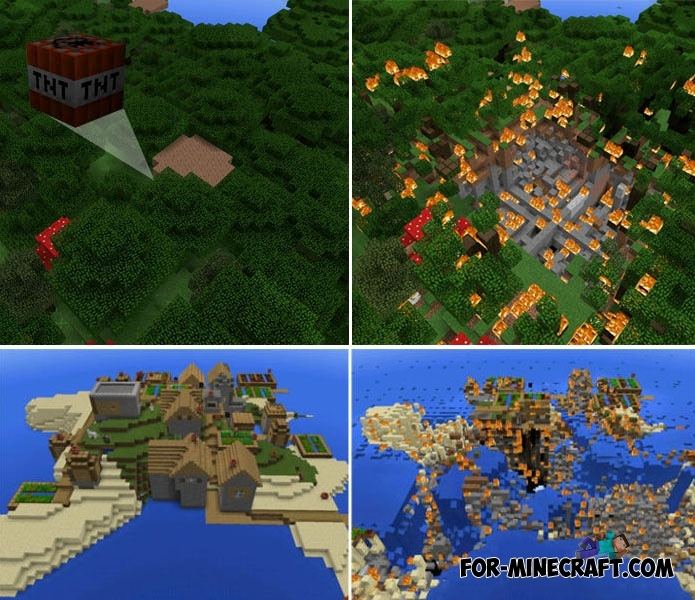 Improved TNT is comparable with the detonation of ten TNT blocks at the same time, which means a fairly wide range. One new block can destroy entire villages and mansions or demolish the city piece by piece. The field of application is infinite, the addon supports multiplayer where you can arrange great mini-games together with friends. Either way, an increased explosion causes small glitches if you do not have a lot of RAM. Do not try to blow up 10 such TNT blocks, otherwise your game will just burst. How to install 10x TNT?